Mission #221 to Genshagen, Germany. Sgt Glenn E. Reiter, Original Waist Gunner (not in photo), was removed from the crew at Molesworth when the crew size was changed from ten to nine men. He flew no combat missions with the 303rd BG(H). Two men who trained with the crew at McDill Field, Florida were also removed from the crew prior to their arrival at Molesworth. Both men were eventually transferred to the 15th Air Force in Italy. Lt Herbert "Herbie" Klinger (N) - Was the Navigator on the overseas flight across the Atlantic Ocean on 27 May 1944. Was removed from the crew at Alconbury prior to the crew arrival at Molesworth. Lt Eugene "Krusher" Kruszynski (B) - Was transferred from the crew after their completion of crew training at McDill Field, FL. 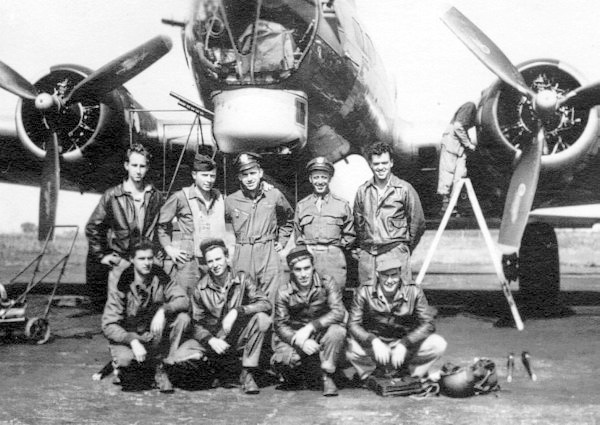 The Crawford Crewmen always fondly felt that "Herbie" and "Krusher" were their regular Navigator and Bombardier after they commenced flying combat missions. 1Lt Warren B. Kidd (CP) - Was upgraded from CoPilot to Pilot on 14 October 1944 but flew no combat missions as 1st Pilot. 2Lt Benton R. Woodbury (N/B) - The Crawford crew had no regular assigned Navigator at Molesworth. 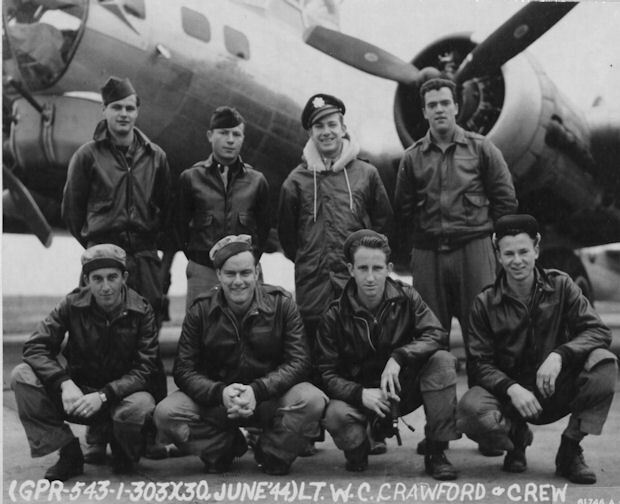 Lt Woodbury flew seven missions with the Crawford Crew - 3 as Navigator and 4 as Bombardier. Was the original Bombardier with the 360th BS Lt James T. Hahn Crew. S/Sgt Nelson R. "Pat" Patton (WG) - Flew 21 missions with the Crawford Crew. Was hit by a large piece of flak on his flak vest on August 3rd and requested relief from combat status following the September 1st mission. S/Sgt Jack E. Britt (Tog) - Flew five missions with the Crawford Crew as Togglier. The Crawford crew had on regularly assigned Togglier or Bombardier at Molesworth. 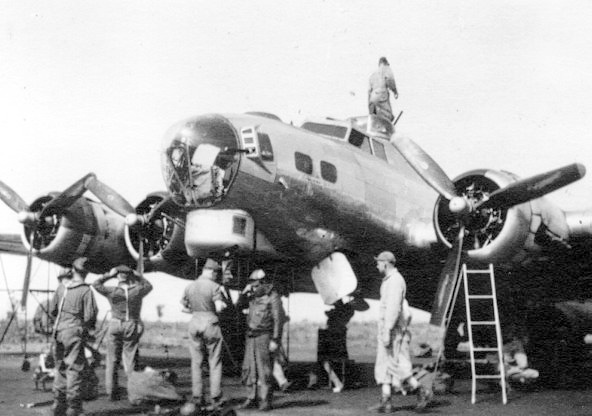 Used various Toggliers for the crews first 18 credited missions and were then assigned Bombardiers. 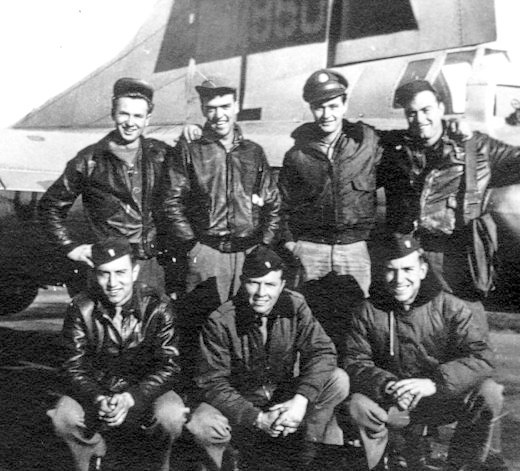 S/Sgt Britt was the regular Ball Turret Gunner on the 360th BS Edgar C. Miller Crew. Lt Constantine J. Duros (B) - Flew two missions with the Crawford Crew including the 15 August 1944 Wiesbaden, Germany mission. Was the regular Bombardier with the 360th BS Bernard C. Fontana Crew.